The practice of scales is considered to be exceedingly dull. Here’s how to make it more interesting and rewarding. This study does have a few tricky corners and should be played at a slow tempo to begin with. The arpeggio section will probably need extra practice to reach the same tempo as the rest of the piece. The Italian guitarist/composer Matteo Carcassi was one of the great virtuosi of the 19th century. Famed during his lifetime for his concert tours of Europe, including annual trips to London and Paris, he is now chiefly remembered for his 25 melodious and progressive studies, Opus 60. This charming collection of pieces contains all the basic elements of technique required in the early study of the guitar. Students of the guitar often view the practice of scales in a less-than-healthy light. 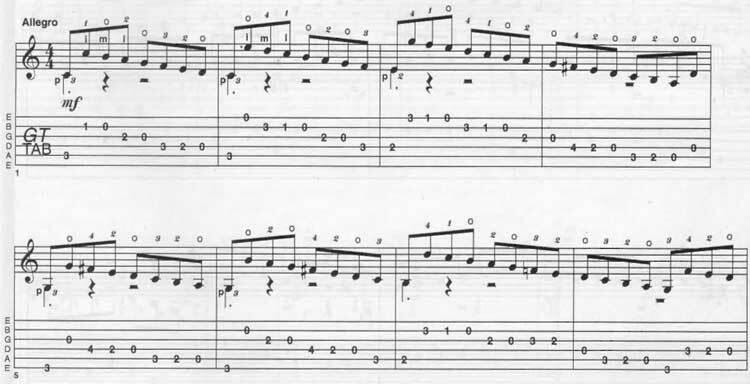 This is unfortunate, as they offer several benefits to both hands: you will increase your knowledge of the fingerboard in the left-hand, and right hand techniques such as alternation, tone quality and evenness of volume can be examined in minute detail during scale practice. If you are able to play scales for an hour or two each day, then all well and good. However, not everyone is able to devote such amounts of time to just one kind of technical exercise, especially if you have limited periods for practice. The main thing is to be consistent in playing them daily – even if it’s for only ten or 15 minutes. Scales do need to be practised on their own, indeed if you are taking grade examinations this is a requirement, but you can achieve the same technical improvements by playing pieces that incorporate scales – such as Carcassi’s study Number 1. Though not actually to do with scales, one of the main technical difficulties of this study occurs in the bass line: namely the notes that are played staccato. This effect can be achieved by damping the relevant string with the thumb just after it has played the note. You can see this more clearly by following photos 1 – 3. Photo 1 shows the right hand in preparation for playing the first notes of the piece. The thumb is resting on the 5th string and T is resting on the 2nd string. Photo 2 shows the thumb after it has played the C at the 3rd fret of the 5th string using a rest stroke. In the 3rd photo, ‘i’ has just played the C on the 1st fret of the 2nd string and at the same time the thumb damps the 5th string. This all happens very quickly so make sure you listen to the track which will help you to hear what it should sound like. Ascending scales require a certain amount of discipline until the correct technique for playing them is mastered. Basically, when you have played a note, the left-hand finger should remain down until any other notes on the same string have been played. This gives the left-hand stability and creates discipline in the fingers. The 4th photo, which shows the beginning of the ascending scale in bar 11, should make this clear. Here the open E has been played, followed by F# with the second finger – this remains down as the G# is played with the fourth finger. The arpeggio passage starting in bar 29 is probably the trickiest section of the entire piece. I suggest practising them as block chords initially. This will make you concentrate on the chord changes without worrying too much about the right hand movements. Only once these have been learned thoroughly should you attempt to arpeggiate them. The ‘Coneierto de Aranjuez’ by Rodrigo is full of blistering scale passages and is well worth listening to. The lute suites by JS Bach also contain numerous examples of masterly scale writing within the context of musical compositions. It’s just a part of Matteo Carcassi Opus One music sheet and tab.